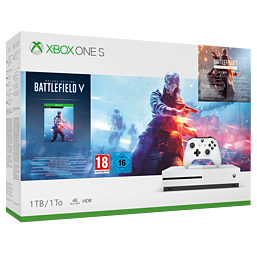 Bundle includes: Xbox One S console, full-game download of Battlefield V Deluxe Edition, 1-month Xbox Game Pass trial with access to over 100+ games and 14-day Xbox Live Gold trial. Enter mankind’s greatest conflict as Battlefield goes back to its roots: World War 2. Join the ranks with a full-game download of Battlefield V Deluxe Edition, supporting HDR graphics. The Deluxe Edition includes paratrooper apparel, special assignments to test your skill, and weekly items coming with Airlift. Whether you’re rallying your troops, watching 4K movies, or streaming gameplay, there’s never been a better time to game with Xbox One. Watch 4K Blu-ray movies and stream 4K video on Netflix, Amazon, Hulu, and more and experience richer, more luminous colours in games and video with High Dynamic Range technology.